Civil engineering is the oldest branch of engineering which is growing right from the stone age of civilization. American society of civil engineering defines civil engineering as the profession in which a knowledge of the mathematical and physical sciences gained by study, experience and practice is applied with judgment to develop ways to utilize economically the materials and forces of the nature for the progressive well being of man. Due to increase in the scope of civil engineering with the passage of time, it has now got diversified into many branches of study. Some of the significant ones include structural engineering, geotechnical engineering, transportation engineering, hydraulic engineering, environmental engineering and a few more important areas of study. Civil engineers are also responsible for building good transportation systems for flow of water, i.e. the water distribution systems. The main activities in this undertaking are designing pipelines for flow of water, drainage facilities, canals, dams, etc. Dams are a major source for non-conventional source of electricity and are hence in high demand today. While designing these structures, the civil engineers take into account the various properties of fluids to calculate the forces acting at different points. The various projects conducted by department In the last semester for institute of Civil Engineer, New Delhi. Planning and layout of games village. 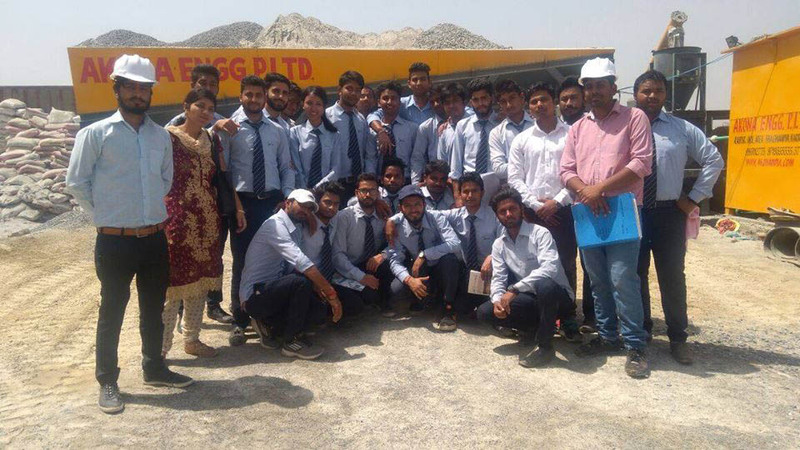 Major construction sites in and around Faridabad the program conducted “Initial phase in metamorphosis of civil engineering students”. Concrete lab– Equipped with 40 ton capacity UTM with attachments for compressive, shearing, bending and tensile tests. Other equipments are hand operated CTM, Cement Auto clave, Compaction factor testing instrument, Le- Chatelier beam mould etc. with other general equipments like oven, curing tank etc. Structural Analysis Lab– Major equipments contains 3- hinged arch apparatus, slope and deflections of the beams, deflection using a simply supported beam, unsymmetrical bending of cantilever beam, three- pin jointed truss, frame studies etc. Fluid Mechanics Lab– Centrifugal pump, Reynolds apparatus, Minor& Major losses apparatus, impact of jet , Venturimeter, orificemeter, various notches. Transportation Engg. Lab– Major Equipments are Los- Angeles abrasion, Deval & Dorry abrasion, Impact test, Specimens for various experiments conducted on aggregate and bitumen etc. Soil Mechanics Lab– Major equipments are Direct shear test apparatus, for Triaxial test, crushing value test & general equipments like oven, weighing balance etc. Auto cad Lab-Equipped with 30 computers. Civil engineering continuous to be a bright industry by the current demand of graduates. Develop sustainable through new technology and techniques. Developing new technologies to fulfill the requirement in environment, housing, water, transportation and help. Connecting student with the innovation in civil engineering by latest embedded techniques. Sana Shadab chose the career in civil engineering at the time when there are very less female candidates in the ﬁeld. She attained the Masters degree in Civil Engineering from UPTU. She has worked extensively on the quality of water which is a major problem of the present and future era. Since the starting of the course at DCTM, Sana has been heading the department. She has established all the labs including concrete lab, surveying lab, structural analysis lab, transportation engg and soil mechanics lab. The major focus of Sana Shadab is to train the students to be industry ready. Under her guidance the first batch of Civil Engg. has passed with ﬂying colours with more than 80% placement offers by L&T, Choice Group, Excel Group and NBCC. She also focused on Teaching-Learning practices of the department leading to merit positions In university examinations in the last four years. Under her supervision Institute of Civil Engineers Govt of India, New Delhi has considered the department as the zonal center where project work related to AMIE CIVIL is conducted. The major projects like Multi Level Car Parking, Transportation Mobility, Bio Gas Plants, Smart Harvesting techniques are developed and implemented by the department.